First juicer: Omega 8006, purchased: 8/16/2012. I purchased the Breville Ikon BJE510XL on 10/12/2012 for my office. I’ve found that it is too time consuming with the Omega 8006 to make juice at home to take to work. And, it is recommended to always drink freshly made juice immediately from the juicer. Storing it depletes the enzymes and nutritional content and, IMO, contradicts making a freshly pressed juice. But first I decided to use it at home and compare it with my Omega 8006. It takes up about the same amount of space as the Omega. Aesthetically, it seems much more impressive than the Omega with it’s brushed silver casing, curvaceous plastic parts, towering design and LCD display. And when you power it up, it definitely sounds more technological as it sounds like a quiet jet engine powering up, vs. the Omega sounding like a blue collar worker grinding away at a monotonous job. My first juice was purple cabbage, cauliflower, broccoli stalks, apple, beet, cucumber and ginger. The Ikon touts a 3 inch wide hopper which is advertised to fit a whole apple without cutting it. My apples did not fit and had to be quartered. And I have an issue with juicing the whole apple with the seeds, which will require additional research. I read on someone’s post somewhere that apple seeds contain small amounts of cyanide and/or strychnine and should be avoided when juicing. During my research before purchasing my first juicer, I discovered there are two types of juicers, centrifugal ejection and masticating. The Ikon is centrifugal, and the Omega 8006 is masticating. The difference between the two is speed and extraction technique. The centrifugal ejection types cut up the produce and eject the pulp against the high speed rotating screen which extracts the juice. The masticating type of juicer slowly crunches up the produce and forces it though a corkscrew style auger that slowly presses the juice out. The enemy to your freshly pressed juice is oxygen. Oxygen oxidizes the enzymes in your juice, meaning it destroys the enzymes. That is the reason it is advised to drink freshly pressed juice immediately, vs. storing it. The first thing I noticed after turning on the Ikon with the juice pitcher attached is the amount of air flowing out of the top. It was significant. The Omega 8006 has zero air flow. With my mini jet engine running, I began inserting the produce. It is definitely impressive to see your produce disappear in a split second and appear in the pitcher as juice. The first thing I noticed about the juice is the amount of foam in the pitcher. It is significant compared to the Omega 8006. 2 inches of foam in the Ikon vs. about 1/8 to 1/4 inch in the Omega 8006. I’m assuming this is due to the air flowing from the Ikon’s 13000 RPM spinning juice extracting screen. The next thing I noticed is the consistency of the juice. While the juice I get from the Omega 8006 always looks dark and dense, the juice from the Ikon is separated and more opaque. So I stirred up the juice and began to drink it. It didn’t seem to have the robust flavor as the juice extracted in the Omega 8006. It seemed much more watery with less flavor. And I couldn’t taste the ginger at all. The following morning, I used the Ikon to make my staple morning juice, carrots, sweet potato, apple & ginger that I faithfully make with my Omega 8006. Again, I was impressed with the speed at which my juice was extracted. And, again there was significantly more foam than I get with the Omega 8006. There was also more separation with Ikon. And, it was a little more watery, but the flavor was OK. And, again I couldn’t taste the ginger at all. The reason I purchased a second juicer was because I needed to be able to make fresh pressed juice at the office. I don’t have the time to do all the preparatory work required for the 8006, or the time it takes to make the juice with the 8006. So I decided that I needed a high speed juicer to be able to enjoy a freshly pressed juice while working. And, as reiterated over and over by John at DiscountJuicers.com, “a freshly pressed juice, regardless of the type of juicer, is better than anything that you can get in a store”. Cleanup of the Ikon vs. the Omega 8006 is more time consuming. Not only does it have bigger parts to clean, but the screen is more time consuming to clean. I’ve seen a lot of people’s cleanup reviews say, “simply rinse it off”. I don’t follow that advise for two reasons. 1st, vegetables stain plastic. My very first carrot juices in the Ikon significantly stained the brand new plastic. I rinsed in extremely hot water and the stains didn’t budge. I used a sponge with dishsoap, and the stains remained. I used the scrubby side of the sponge and only removed about 90% of the orange stain. Daily use will be evident no matter what, but I’m at least removing as much as I can. 2nd, vegetables also leave a residue over time. I’ve been using the Omega 8006 for 2 months, several times per day and the residue is building up no matter how much I scrub it. Both juicers have a juice catcher and a pulp catcher. The Omega 8006’s are small and very simple to clean. The Ikon’s are larger. To make the pulp catcher easier to clean, or eliminate cleaning altogether, I place one of the plastic produce bags in it. This catches all the produce, and eliminates having to clean it. One thing I noted when cleaning the pulp is the Ikon’s pulp is still very wet. The pulp from the Omega 8006 is definitely much dryer. One thing I like about the masticating style juicers is you can run the pulp back through it to get more juice from it. You cannot do this with a centrifugal ejection style juicer. And with the price of organic produce, I want to get as much juice as I can from my produce. Another cleanup issue I should mention is storage while drying. If you have space restrictions, you should note that if you air dry your dishes and/or juicer parts, that the size of the parts of the Ikon take up considerably more space than the parts for the Omega 8006. I guess there is something to be said for monotony and taking your time. The quality of the juice that I get from the masticating Omega 8006 is by far better than what I get from the centrifugal Breville Ikon. Note that this has nothing to do with the brand names of the juicers. Omega also produces centrifugal juicers. It has everything to do with the extraction method. Both methods do what they’re intended to do. It is up to you to decide which method fits your lifestyle. When I’m at home, I don’t mind taking the time to make a better quality juice. However, at the office, I don’t have that time, but still want a freshly made juice. I should also mention the Norwalk Juicer. This is the Mac Daddy of juicers with a Mac Daddy price of around $2400. This juicer is a 2 step juicer. The first step you grind up the produce into a cloth bag. The next step you place the bag in the hydraulic press which presses the juice from the pulp. This is said to be the best way to get the most nutrients and juice from the pulp. You can see additional information here and here. Another recommendation when choosing a juicer is the warranty period. In my case, the Omega 8006 has a 15 year warranty. 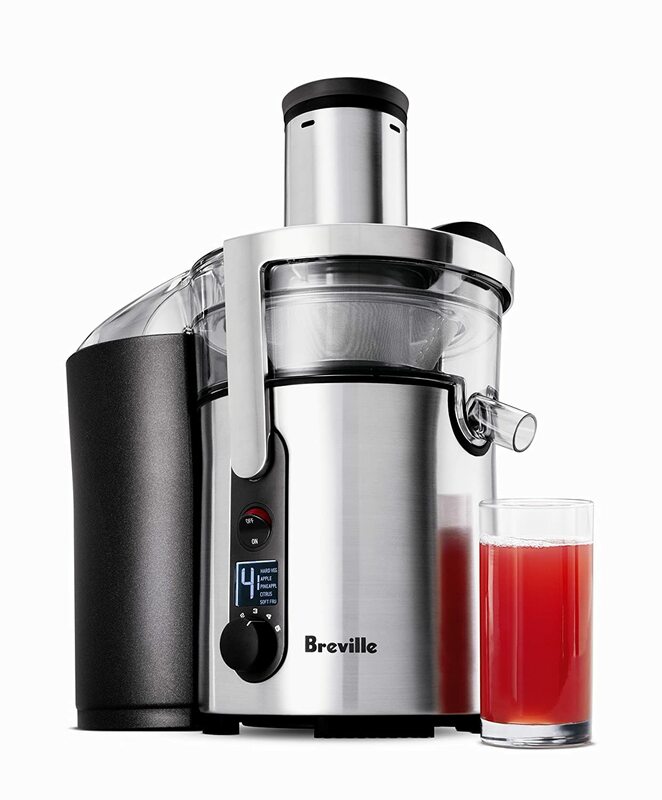 The Breville Ikon has 1 year warranty. I did a lot of internet research before purchasing my first juicer. Where I found the most helpful information was with John Kohler at DiscountJuicers.com and his YouTube channel . One more thing. The pulp. What should you do with the pulp? The pulp can be used to make healthy foods such as vegetable crackers, added to muffins and many other things such as adding some to your pets food. Search the internet for ‘what to do with juicer pulp’. It also makes great compost, especially if you are using organic produce.